Hi! Thank you for taking the time to read our story. We are here on the ‘Gofundme’ Site to raise money for the Ongoing Cost required to provide care to the many adoptable parrots we have in foster care. Our rescue Meika’s Safehouse was established in 2008, and was provincially registered as a Not-For-Profit since 2012. We provide care for all types of birds from Finches to Macaws with a few Wild birds in between. It warms our hearts to watch the bird’s blossom in our care as a result of an exceptional diet, training, veterinarian care, love and enrichment. It’s been quite a challenging few years, but with the support of our friends, family and followers and our previous GoFundMe Campaign we have been able to help close to 400 birds in the last two years. In 2016 we took part in two large rescues. In May of 2016, due to the Wild Fire State of emergency in Fort McMurray we provided care for 127 displaced evacuated parrots. 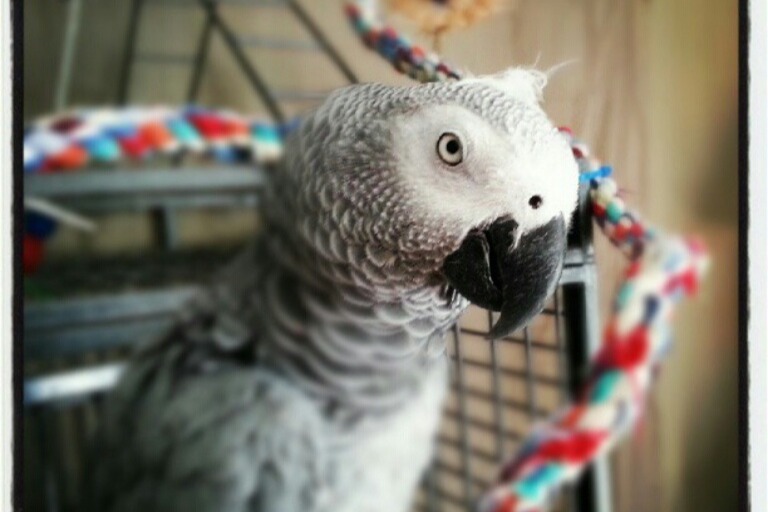 In the fall of 2016, we started assisting Greyhaven by transferring 36 large parrots from the World Parrot Rescue in British Columbia to us here in Sherwood Park. In the spring of 2017, we received a call regarding the displacement of 83 parrots. 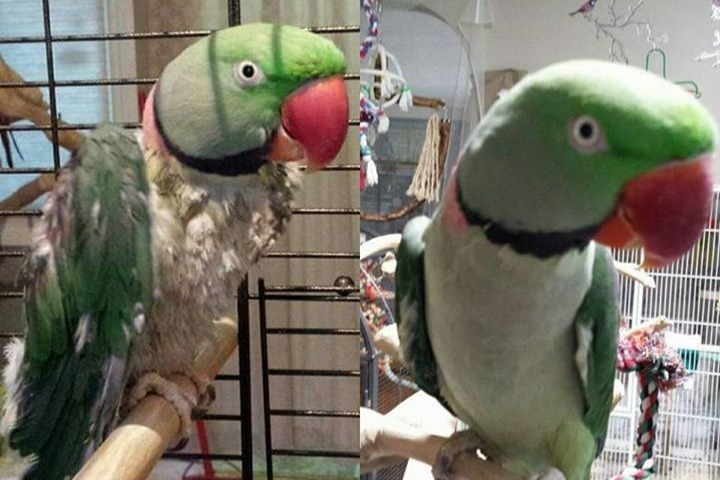 A Hobby breeder had passed away and there was no one to look after these birds. None of these birds had cages, perches, toys or any other items that could be used to assist them with their transition. We were lucky to receive donations to buy new cages and other items for these birds. This was a huge undertaking for us, and during this period we were still accepting owner surrenders for birds that no longer had homes. You may be curious about our Income from Donations and from Adoptions. In 2017 our income was $21,431.05 while our expenses were $22,315.52 which left us with a deficit of ($884.47). There are three major areas of expense including cages, supplies such as perches, locks, bowls, cleaning supplies and toys, which totalled $7,293.50. On food we spent $6,721.29 and on Veterinarian Care we spent $6,112.38. We have participated in some fundraising campaigns which have had some operating costs (Chocolate Almond Sales, Booster Juice Sales) which were $2085.46 and Bank Fee’s $45.50. We currently have decreased our cost associated with banking thanks to our Not for Profit Status. We would like to continue to do this for many years to come and with your help we can make that happen. In Alberta, there are limited resources for the Care of Domestic Birds as they are quite unique and require different care than other animals. We have lots of really great plans for the upcoming years and we REALLY would like to follow through with them with your help! We appreciate your support very much! Hi Everyone! I just wanted to stop in to thank everyone who has donated and shared our campaign. Your support means so much to us and the birds we help. Without external support, we wouldn't be able to help as many birds as we do for as long as they need to be helped. As of today we currently have 33 birds in foster care, 1 in sactuary care and an expected 3 more foster birds arriving next week. The birds range from zebra finches to macaws and a bunch of medium birds in between. A lot of the birds we have right now are pretty wild and crazy. We call these birds "project birds" because they require a lot of time, patience and training and we need to have zero expectations of them. These are the hardest birds to place into homes because they can bite, they don't like to cuddle, and sometimes they're quite scared of people. These types of birds end up staying in the rescue for years because they're often overlooked for the cute and cuddly tame guys. We keep our gofundme campaign running because these birds require ongoing and costly care until the right home comes along. Some of our biggest expenses include, food, enrichment and veterinary care. Parrots require a lot of enrichment. They are destructive and love to chew everything. Keeping up with toys in their cage is an ongoing battle, especially with the macaws, cockatoos, Indian ringnecks, Alexandrines and the greys. A $30 toy lasts a macaw 5 minutes so we don't put too many cheap toys in their cages...they get the $100- $200 toys so they can last longer - it provides larger pieces of wood to chew. Food - in order to keep the birds healthy and happy, it's really important to feed them a proper diet consisting of daily fresh fruits and veggies, pellets, grains, and gourmet nuts and seeds. A lot of health problems we see in rescued birds are a direct result of improper diets. A lot of behavior problems can be linked to improper diet. When a bird doesn't feel good, it can act out, it's plumage can be greasy, dull, barbared or pulled out completely, it can have swollen joints, overgrown beaks and be over or underweight. This is why we take diet and nutrition very seriously with birds here because we feel they have been through enough already, the very least we can do, if they don't want to interact with us yet, is to provide them with top of the line food. Veterinary care - every single bird - even the smallest of finches - gets veterinary care when they are with us. We feel every living being should have access to medical treatment should it be required. The responsibility is on us humans who bring these animals into captivity to provide them with medical care so they do not suffer. We feel every animal deserves a fair chance to live and thrive.